Absolutely wonderful flavor and very easy to make. Serve this as chicken soup or chicken stew. For a great variation leave out the potatoes and serve it with rice. This is a very flavorful chicken recipe. Lay chicken flat, press down on breast to crush breastbone. Pour wine and water into pot and add rosemary. Bring liquid to a boil, reduce heat to medium-low, cover and cook about 1 hour. Arrange vegetables around chicken, cover and cook additional 30 minutes. Remove chicken to platter, cool enough to carve. 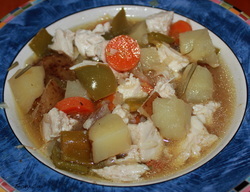 Place vegetables in bowls add chicken and broth. Serve warm. Reserve any leftover chicken for another use. To thicken broth for stew, after removing chicken and vegetables add a mixture of 2 tablespoon cornstarch and 1 cold tablespoon water to broth. Bring to a boil, stir until thickened.